Brazilian street artists Otavio and Gustavo Pandolfo, who also happen to be twin brothers, are bringing a taste of the favelas in their native land to Boston with a new exhibit at the Institute of Contemporary Art. Known under the name Os Gêmeos, ‘The Twins’ in Portuguese, the duo have created two public works which are on display at the exhibit, running until November 25. With the works they aim to take imagery that may at first be mysterious or unfamiliar into something that is universal. The first piece is Agradecendo A Chuva (‘Thanks for the Rain’). Painted on an 8-by-5 foot panel, it features the image of two street musicians in the middle of a deserted road, surrounded by brightly coloured homes, as one of the performers appears to pray. Dentro do arco-iris, e assim, or ‘Within the Rainbow’, was first painted in 2010 and measures at nearly 17 feet across and 8 feet high. The vivid piece, which looks like a long wall mural, combines surrealism and graffiti-style imagery with traditional hallmarks of Brazillian street art. The 38-year-old Pandolfo brothers grew up in the popular tourist spot of Cambuci, a city of 22 million people located in Sao Paulo. 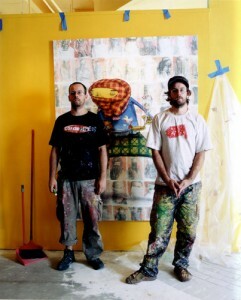 Deeply influenced by graffiti culture and hip hop music the brothers had to use house paint, rollers and brushes to create their first murals, rather than spray paint. Much of their work is improvisational and combines their American influences with elements of ‘pixacao’, the graffiti style seen in Sao Paulo and Rio de Janeiro, and images from Brazilian folklore.